The Eastern culture has always been fascinating – out of this world tradition, original Architecture, wonderful culture and the art. Morocco happens to be just in the loop with all these fascinating customs and traditions which became increasingly interesting and popular among the locals and tourists alike. So, for today expect to see grandeur and beauty beyond what is imaginable! 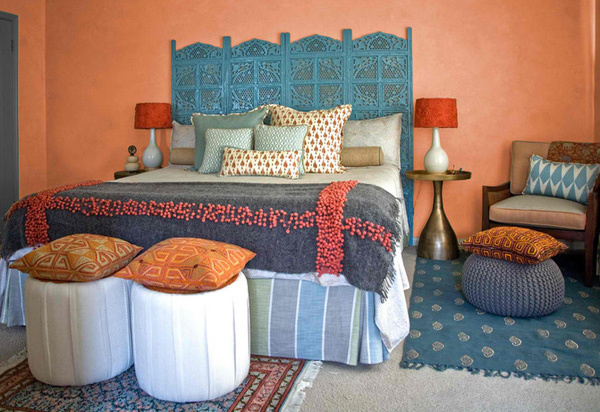 Marvel in the 15 Marvelous Moroccan Bedrooms which features Arabian patterns, bright fabrics and fantastic lanterns. But it’s not necessary to keep the rules very strictly to create such an Eastern fairy-tale, you can just take a neutral color palette and add lanterns, candle holders, poufs and patterns which are characteristic of Morocco, and absolutely any touch may be added to make any interior you want – from a girlish interior to a calm and neutral one. 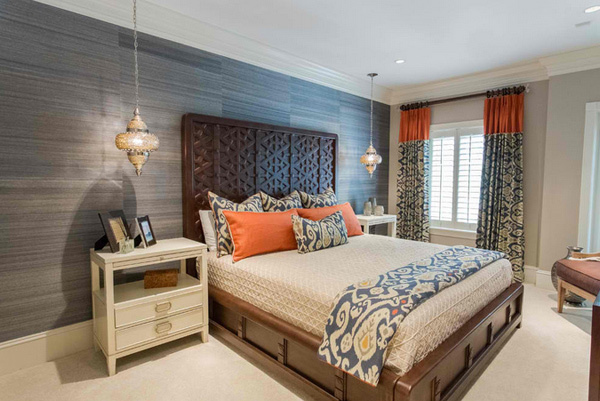 These bedrooms bear a secret, they fascinate and remind of the Arabian Nights stories. Mysteries and adventures begin! 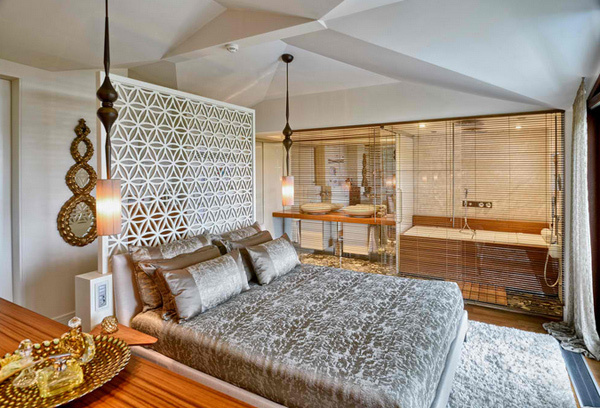 The wall treatment for this bedroom is beyond stunning! 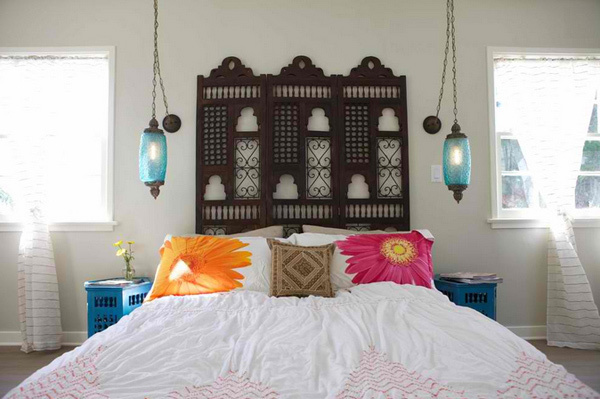 Not to mention how lovely the headboard is – and those lanterns, oh those lanterns! We definitely love this bedroom! We like the white beddings with splashes of colors and patterns scattered all around the room. The wall color is definitely the most stunning part of this bedroom. Transport yourself to another world after a long day with a headboard representing places you’ve travelled to – or hope to visit someday. 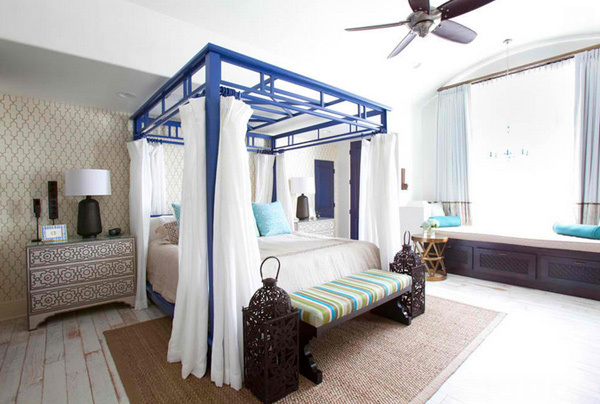 This bed is adorned with a Moroccan screen that Design Vidal affixed to the wall. Blue Moroccan lamps and tables on each side set a romantic tone and could fool you into thinking you’re waking up in a foreign land. The placement of the bed and the bathroom is sort of confusing but because of all the flashy decors and trimmings make us think about questioning the design because this room is just divine! Beautiful colors coordinated with white sheets and spread. The simplicity of this bedroom makes us question if by any chances there is really that one Moroccan bedroom not as flashy as the rest. We love the theme, colors, footstool, Morrocan in ambiance, without the traditional electric blue and accompanying vibrant full chroma. A room anyone could sleep in. Moroccan area rug. Asian ceramic stool. Pink, yellow, and white floral accent pillows. Hand-block floral print on natural linen curtains. Mixes of contemporary and Moroccan. Go bold and go for height – dynamic fabrics and exaggerated verticality on a headboard can change the entire feeling of a room. These brilliant textiles add to the Moroccan style of this home, and the wall behind them painted up to chair-rail height tricks the eye, distorting how we perceive the colors and proportions. 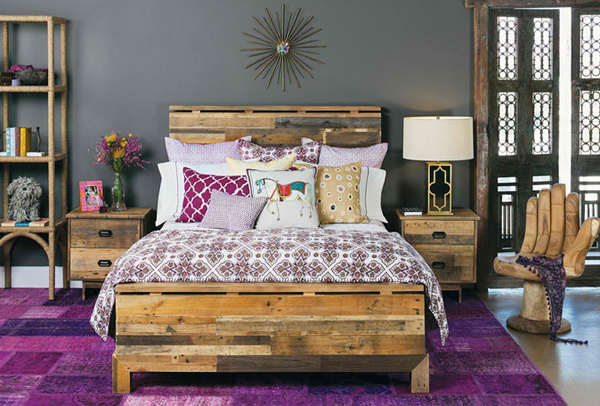 Combine clean, modern lines with worldly and exotic bedding, accessories, and accents. 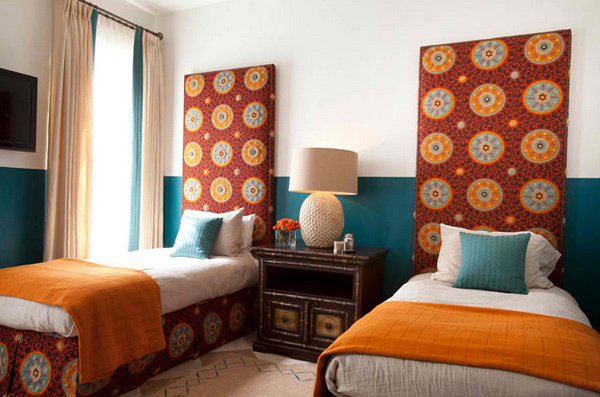 Earthy and eclectic, the bold patterns and silhouettes take you away to the Moroccan coast – what are you waiting for? 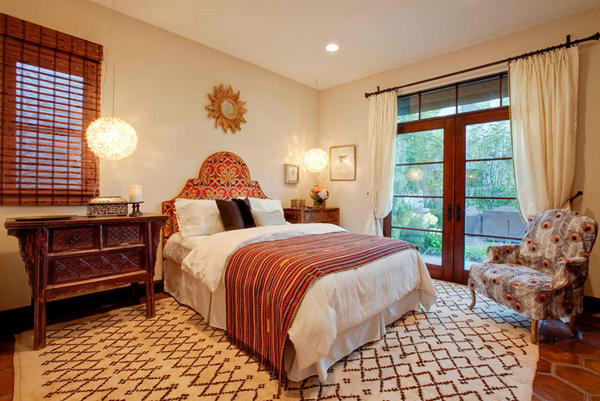 Sean Gaston’s Master Bedroom featured in the Marrakesh Country Club Designer Showcase House as part of Palm Spring’s Modernism Week. 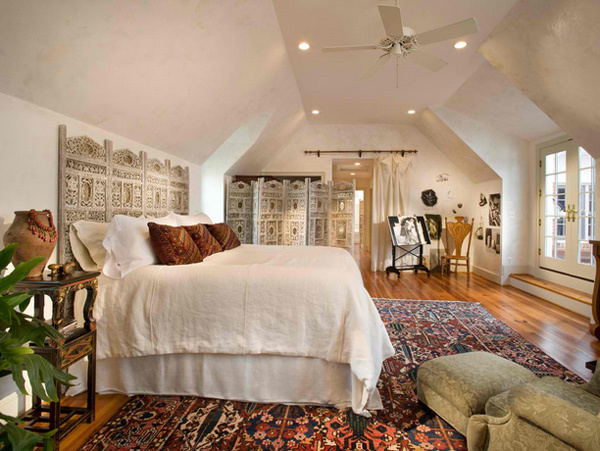 Artfully eclectic, this room celebrates the hand made and textural. Layers of burnished plaster offset antique brick, smooth heart pine floors, custom sconces and hand carved screens. Love the closets with mirrors on them and little window seat in between; even the details on the foot stools and the bedside tables are unique and classy. 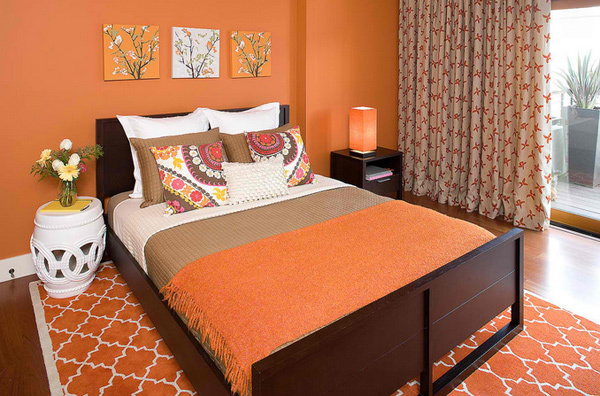 The warm colors chosen for this bedroom are beyond exciting and fun. We love the lantern details above the simple bedside tables too! 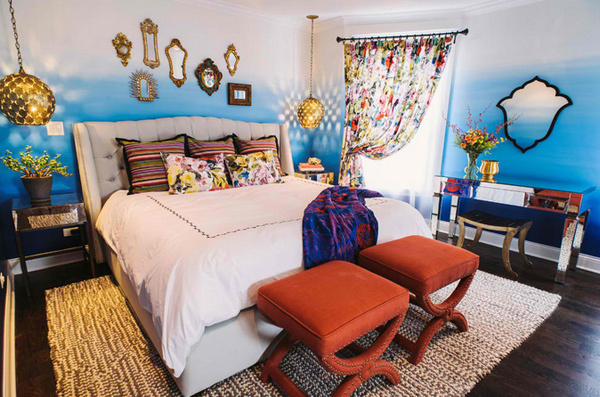 Inspired by the colors in a blanket brought back from a trip to India, this Master Bedroom was redesigned with a contemporary take on classic Indian colors and textiles. The warm tones brighten, while the cool colors ground the overall design. Cobalt blue appears again in the master bedroom on the bed and the doors. The light-colored wood floors that worked with the home’s former French country style translated well to the new Moroccan style. “We loved them and thought they brought a bit of rustic ambience,” Umansky says. We have a list about the 15 Outstanding Moroccan Living Room Designs which is just as beautiful and stunning as the list we have shown you today. Whenever you will go back to this list, we would always want you to recall how you loved the pictures of the gorgeous bedroom designs. Again, Marvel in the 15 Marvelous Moroccan Bedrooms which showcase the beauty of the East!